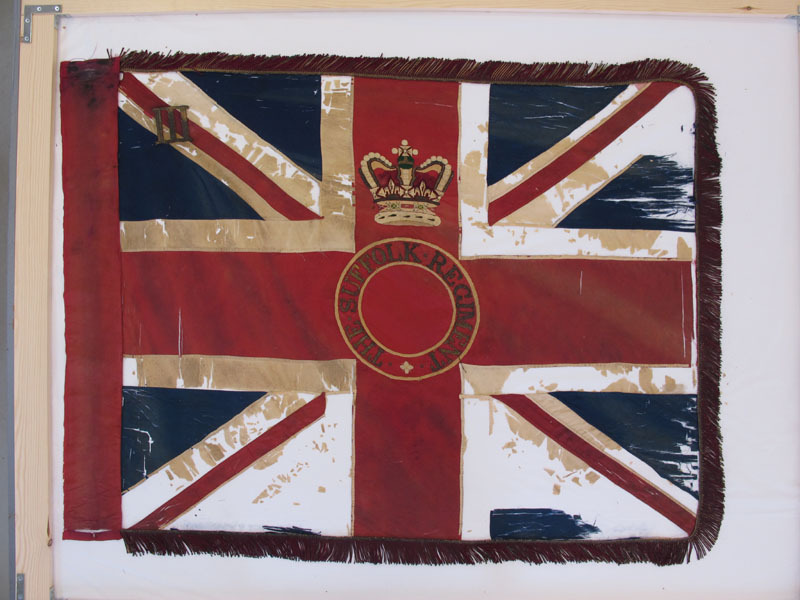 When St Mary’s Church at Ickworth was undergoing restoration we worked on two Regimental Colours (Regimental Colour and Queen’s Colour) which were stored at the Regimental Museum in Bury St Edmunds but were originally laid up at St Mary’s Church in 1912. 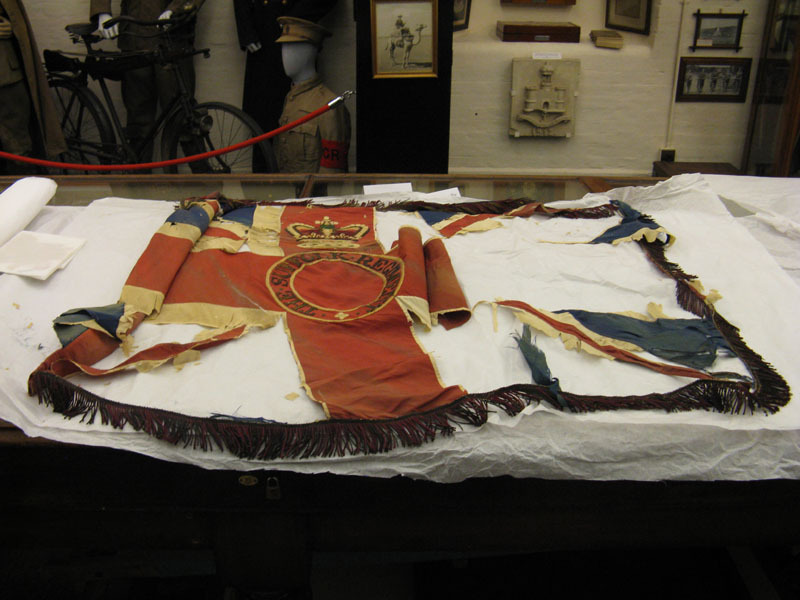 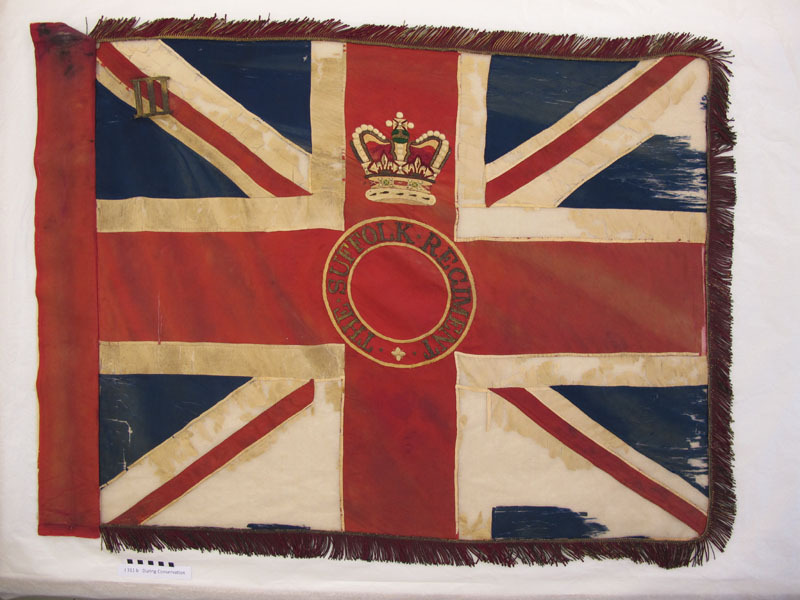 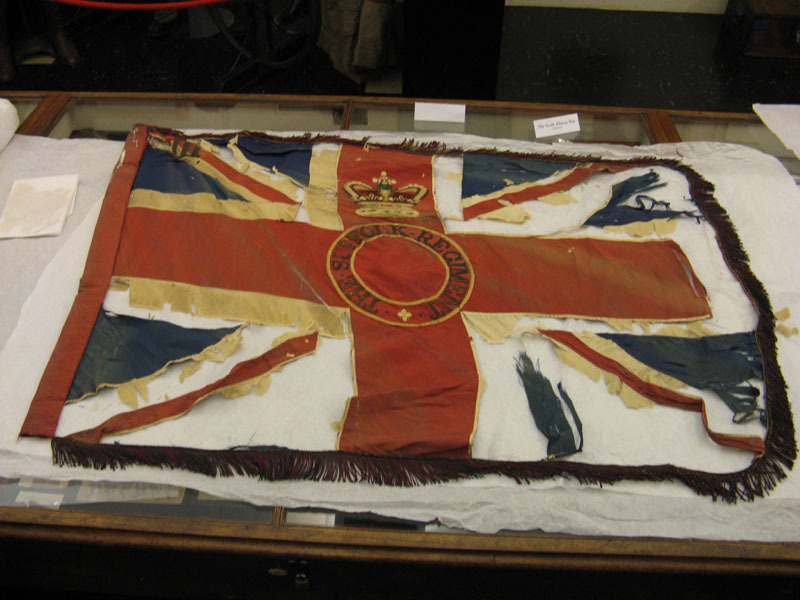 The Regimental Colour had previously been conserved while the Queen’s Colour was unconserved and in a very fragile condition. 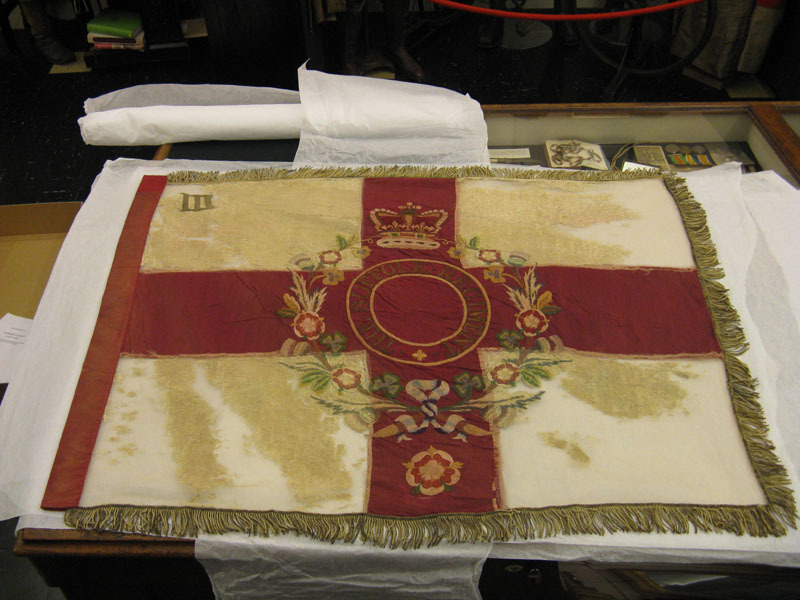 The Ickworth Church Conservation Trust wanted both Colours to be conserved in order to hang them in the church after the restoration. 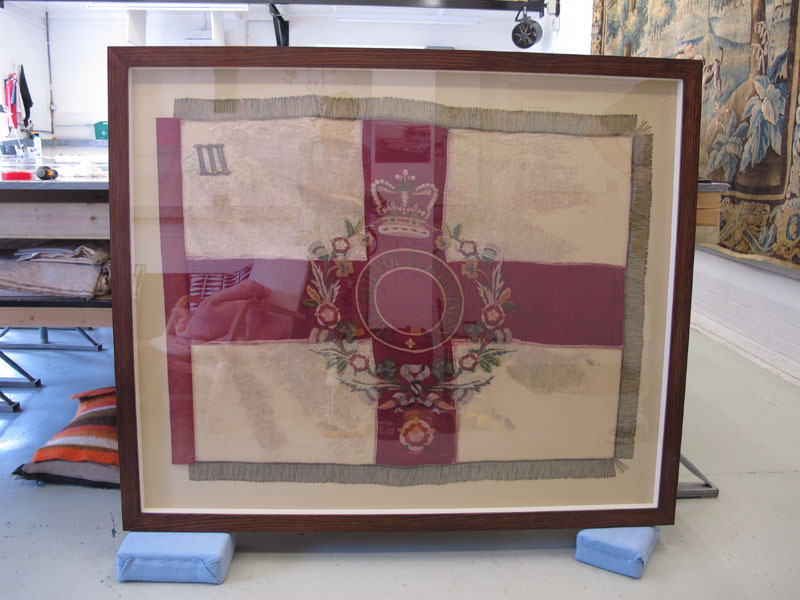 Unfortunately their condition really would not allow this and it was determined that they should be framed for safe display, nevertheless the Trust wanted to keep the option to hang them freely in the future and so this was taken into account in the conservation treatment. 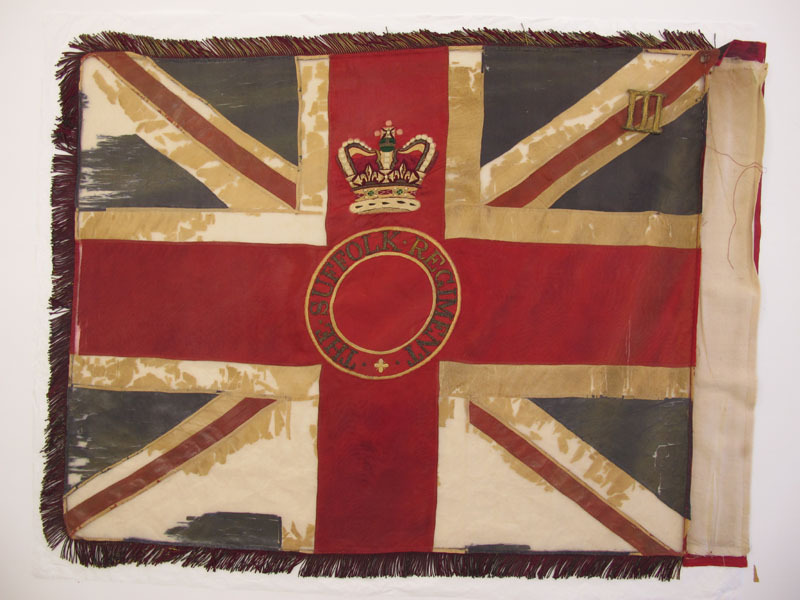 The Regimental Colour had been previously conserved and only a small amount of work was needed to make it safe for display. 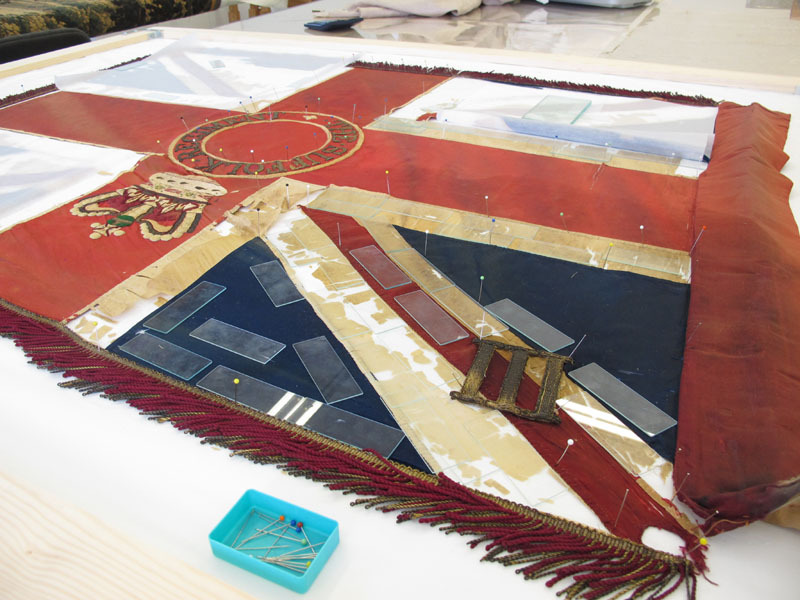 The Queen’s Colour required a great deal of work as it was completely unconserved and the silk fabric was completely shattered from exposure to light and hanging for many years, as can be seen in the photographs. 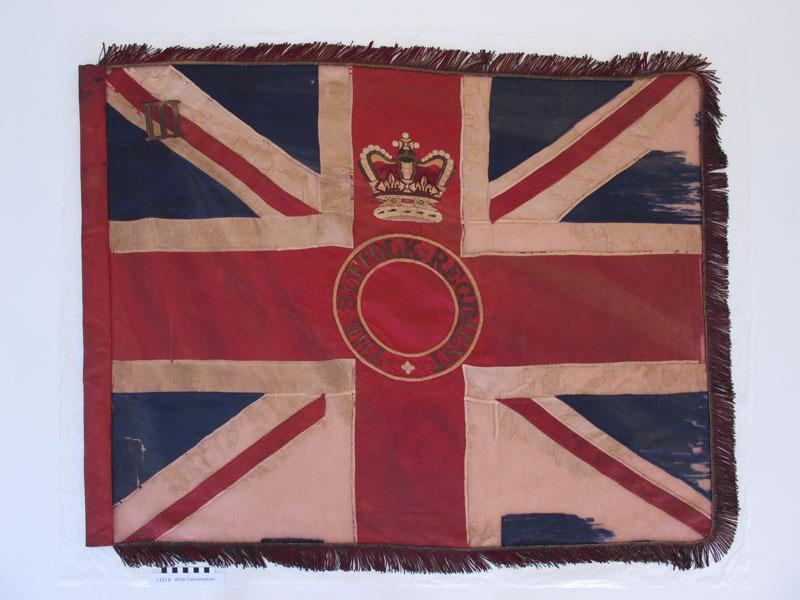 Cleaning was required, however testing showed that some of the colours started bleeding very quickly on the introduction of moisture. 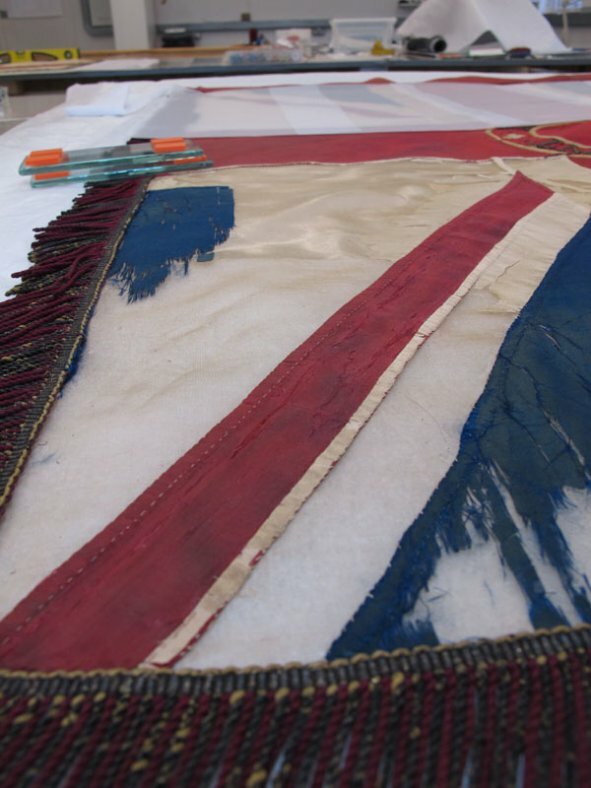 Localised cleaning involving the flushing through of washing solution rather than full immersion was carried out in sections to ensure a high level of control. 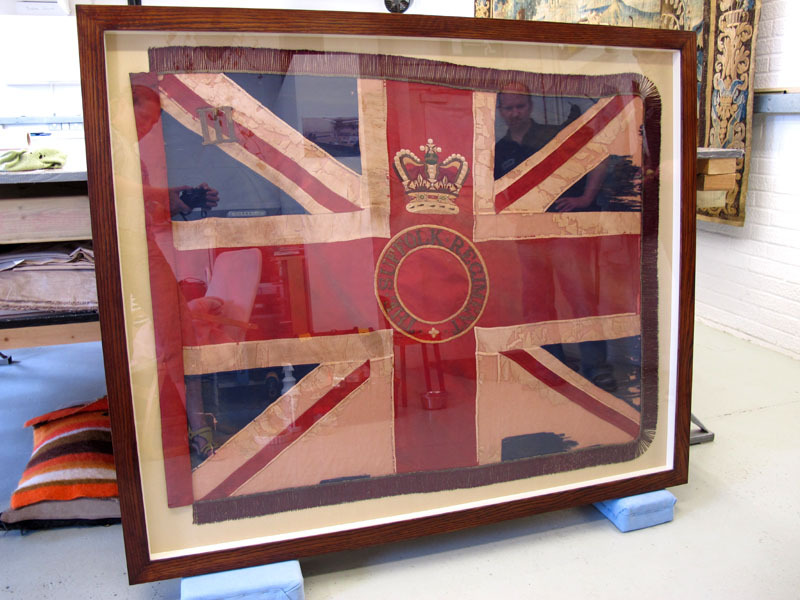 The Colour was then supported using silk crèpeline dyed to match the colours of the Colour. 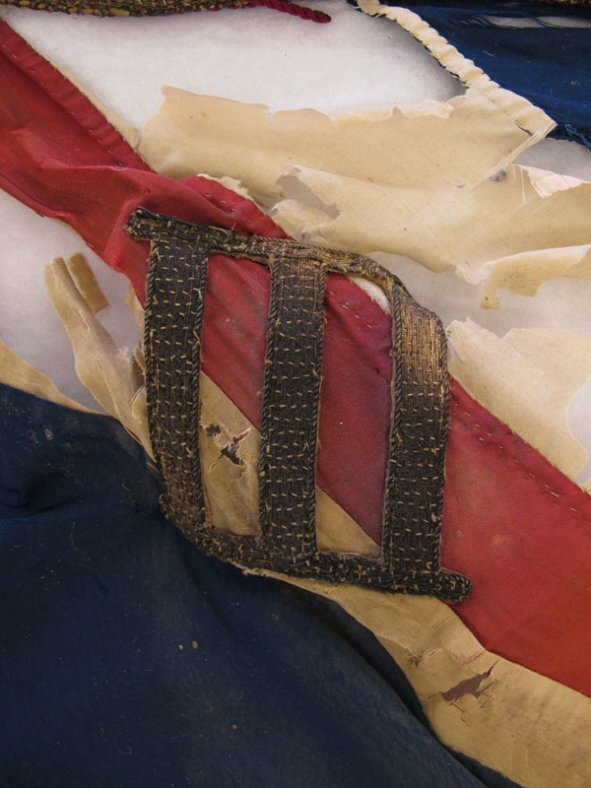 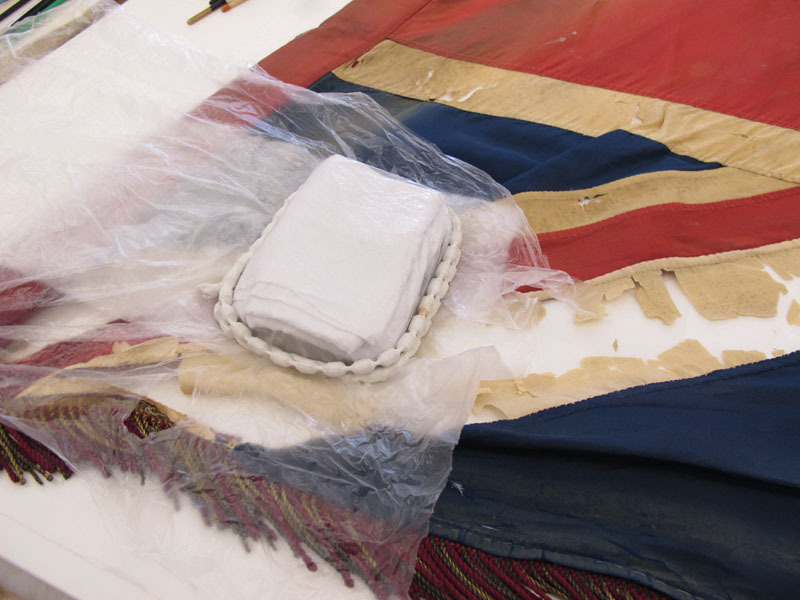 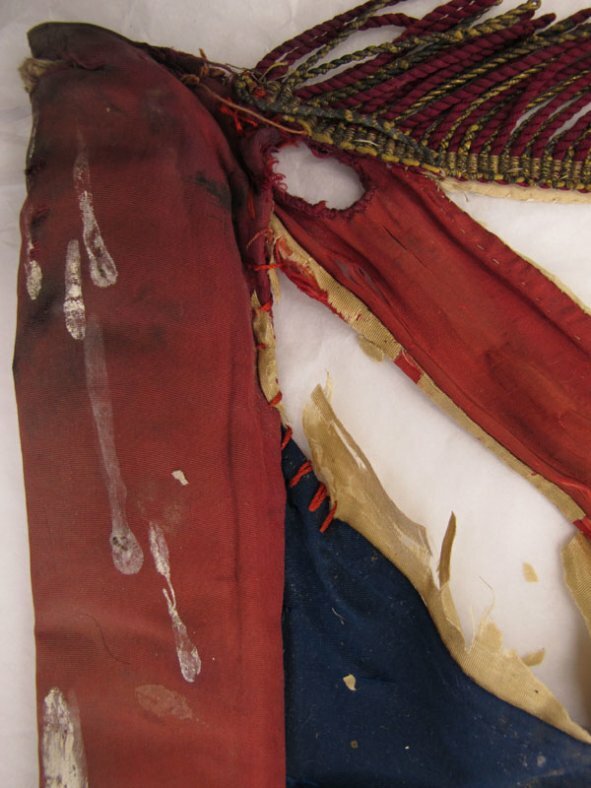 The silk support was coated with a conservation adhesive to attach this support fabric to the fabric of the object. 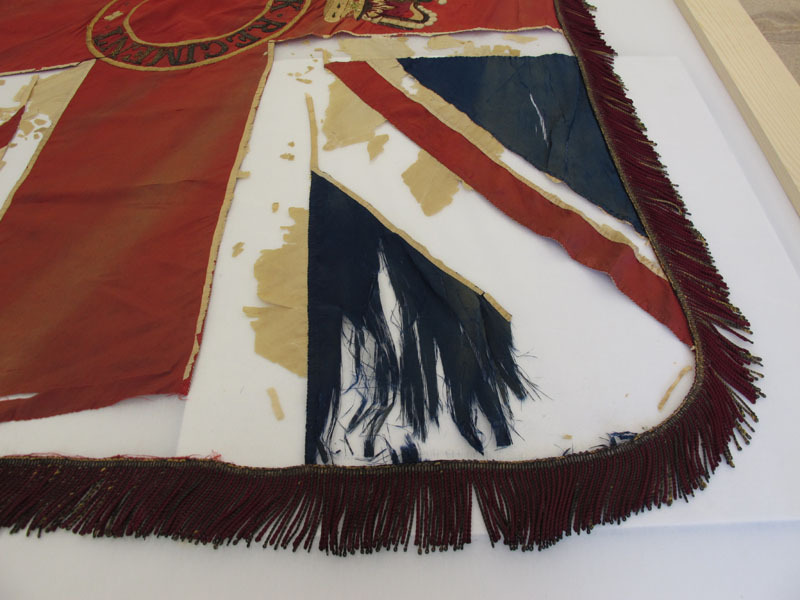 The whole Colour was then sandwiched in two layers of conservation net to provide further support. 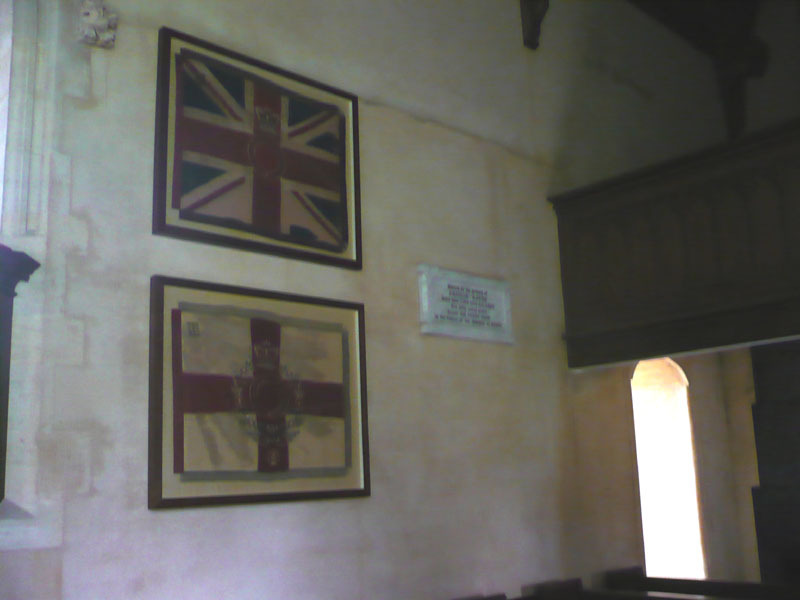 Both Colours were subsequently framed by Sudbury Picture Framers and then positioned in the church. 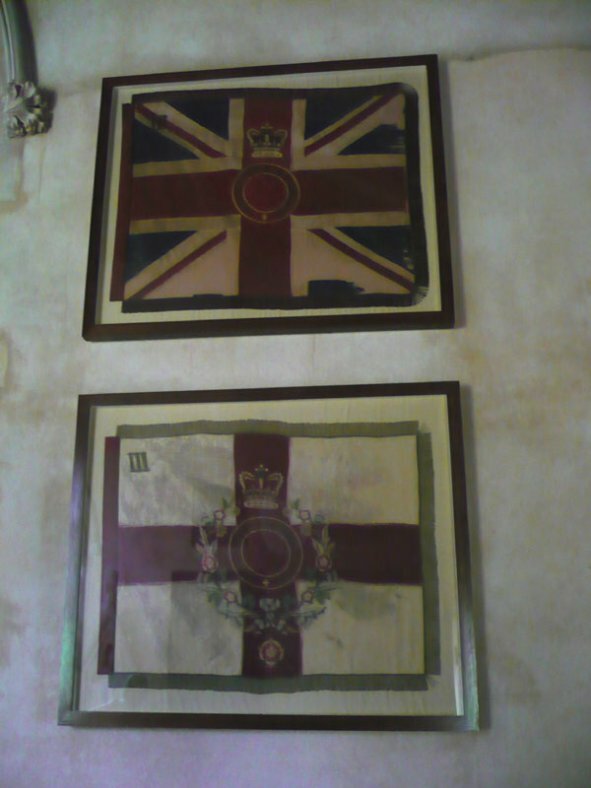 The Ickworth Church Conservation Trust invited us to attend the Service of Blessing to formally open the church on 25th June 2013 and it was a pleasure to be able to attend.